TV Aerials and FreeSat installation in Dewsbury? 1We are Dewsbury specialists in Digital TV Aerial, Freesat, Freeview, Sky and European satellite system installation. 2 TV Aerials Dewsbury also repair TV Aerials, satellite systems. We can install multiroom systems and visual/audio distribution. Digital TV Aerials Dewsbury work carries a 12 months guarantee on all parts and labour and we also work on a same day service if required. Our own engineers are highly trained in all aspects of satellite and digital TV aerial repairs and installation, from a simple single digital aerial to a full digital TV Distribution systems, we have the knowledge and the expertise. Satellite installation is another area we excel, with Sky, FreeSat Installations with Sky Multiroom and Free Sat distribution you will be able to watch all your favourite programs in any room. We provide and are installers of DAB, FM aerials and also install both I.R.S. Systems, Communal Aerial and SMATV Systems. 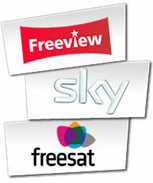 We have the very best line up of service providers from pay to view like Sky to the very best option FreeSat HD all you ever want and best of all its completely FREE! All our TV aerial and satellite installations are covered by our installation guarantee. We are committed to raising the standards within our industry so that the consumer is assured of a quality installation." New services include CAT6 TV distribution, CCTV and Alarm installtion"
If you live in the Dewsbury area and need a new or replacemet Digital TV Aerial then we have the solution. TV Aerials Dewsbury (CN Newell Dewsbury) are Yorkshire’s longest establish TV Aerial company providing all our customers with a wealth of knowledge in TV Aerial be it Digital terrestrial TV to Freeview, Freesat, Sky and European Satellite Systems. No matter your requirement, it may be just a TV socket extension, a new plug socket or wall mount your new LED TV, you can rest assured that we have it covered and all fully guaranteed. We don’t just install TV Aerials - TV Aerials Dewsbury (CN Newell Dewsbury) offer free quotations for all new freesat and freesatHD installations, and can usually attend your property on the same day, normally within hours of your telephone call. Our freesat, freesatHD engineers carry everything required to carry out any freesat installation at your home, and should you wish, can have your freesat system fully installed and configured during the same visit. Digital TV Aerials, Digital TV Aerial Installations - Communal TV Aerial Installers - Freesat Installations - I.R.S Systems Installations in Dewsbury.